Under the guidance of CEO Arnaud Nicolas, L’Epée 1839 has developed an exceptional table clock collection, encompassing a range of sophisticated classic Carriage Clocks, Contemporary Design Clocks and avant-garde horological sculptures. This last collection launched for the 175th Anniversary, is intended to shock, evoke and inspire people. L’Epée clocks feature complications including retrograde seconds, power reserve indicators, perpetual calendars – all designed and manufactured in-house. 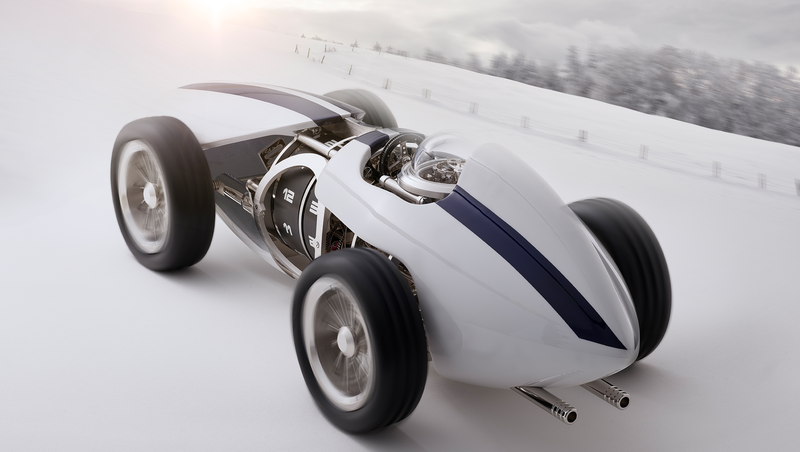 This vintage-inspired race car and a modern clock in one is a kinetic sculpture that tells the time. Designed by Georg Foster, a promising young newcomer and major contributor to this second collaboration between ECAL and the Swiss manufacture. With a futuristic design inspired by the film world, and a subtle nod to the mechanics of yesteryear, the Time Machine is nothing less than a mechanical sculpture that tells the time. Immediate boarding on the Hot Balloon, the mechanical clock in the form of a hot air balloon created by L’Épée 1839. This suspended clock follows the brand’s other co-creations – the Vanitas and Arachnophobia wall clocks.